Mahiki Club is an unique nightclub. The club resides in Dover Street, the heart of Mayfair. Also, you can easily reach the club form Green Park or Piccadilly Circus stations. The name “Mahiki” comes from the Polynesian path to the underworld. Mahiki opened in October 2006 by Nick House and Piers Adams. Its structure is very peculiar. Hence, it has no VIP room. The venue has two floors. The vibe is exclusive and slightly more reserved then other venues. The club interior projects you into a tropical island paradise. It boasts hand-made Princess’ chairs, colorful Hawaiian cushions and hand-carved Tiki figures. Mahiki is also famous for its drinks menu. The menu has been designed just for the club. Mahiki mixologist creates everything in front of you. Club staff serve drinks in a selection of tropical themed glasses. Famous are the “Tiki mugs”. Also, a Typical cocktail is the infamous “treasure chest”. This is a proper treasure chest filled with a fruity champagne concoction with dry ice and sparklers. In conclusion, this really give the wow factor to any night out. Alongside with a tropical vibe, the club plays older music and has a retro feel. Since the opening, the club has attracted media attention as a favorite haunt of royals. Guests have spotted there Prince William and Harry. Celebs such as Rihanna, Amanda Seyfried, Lady Gaga, Nicola Roberta, Paris Hilton often comes to Mahiki. Despite its popularity and perfect Mayfair location, the club has a relaxed door policy. Door opens early at 9pm. In addition, a selection of fingers food can be served from 9pm to 10pm. Once you step into, you will be put into a tropical world. The venue fits with a Tiki lounge bar. It serves up a selection Mahiki own cocktail creations. The lighting in Mahiki is lush and dimly lit giving a romantic setting. Hence, it is a perfect place to spend the evening with you partner or on a date. It may even feel like you are on a tropical island on holiday rather than to a posh Mayfair club. We are looking forward to party with you at Mahiki. Hosting days at Mahiki London Club. Our team has started to work at Mahiki on a regular base in Nov 2014. Since then, our main night is Tuesday. Furthermore, we added a night on Monday. By joining our guestlist you can dine with us. Therefore you can taste the delicious finger-food served early around 9:45pm. We also offer Prosecco. Although, the dinner is mainly for ladies. We can host few guys as well. The menu changes every week. Consequently, the party starts around 10pm or 10:15pm. We always get the best table at Mahiki. Our table at Mahiki is usually upstairs. We always reward our guests with some free vodka-drinks. Do expect also the famous chest of treasure. 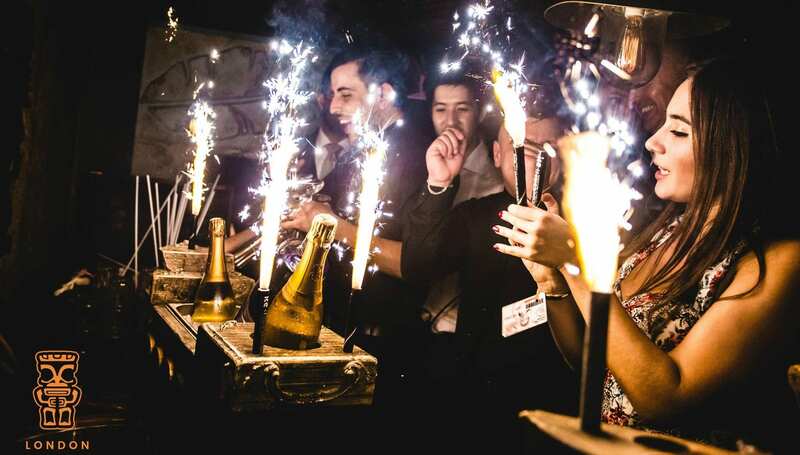 Booking a VIP table gives you a blast to your party. Contact us to book your table. We can book tables and guestlist any opening day. Just contact us. What we think about Mahiki London Club. Mahiki Club has a famous reputation in UK. We perfectly agree with all reviews. The Mahiki aspects we love are the cocktails menu and the dinner. From arrival to inside everything is smooth at Mahiki. Queue is not long. It moves fast. Floor and tables staff are really professional. Finally, amazing oriental waitresses treats customers always as special guests.